We train and educate the manpower in the field of microbiology and to explore new avenues in the field of microbiology, especially in the areas of food microbiology, dairy microbiology, food safety, food hygiene and quality control. This unique unmatched program covers gambit aspects of microbial life. Department of Microbiology has made significant contributions in the field of conventional diagnostics and vaccines as is evident from the fact that many students both at Ph.D. and Master level had been trained. The trained man power is serving in various capacities at different private and public establishments of the country. The department is actively engaged in teaching undergraduate and postgraduate (M. Phil + Ph.D.), deficiency and diploma courses and is organizing variety of workshops to train man power in advanced techniques being used in the biologics, pharmaceutical and chemical diagnostics production units. The department is well equipped with latest laboratory facilities like Cell culture, Immunology and Vaccinology, Molecular Biology, Mycology, Bacteriology, Virology, Quality Operations Laboratory and University Diagnostic Laboratory. In year 2007, a new degree program titled “B.S. (Hons.) Applied Microbiology” was initiated. First three batches are going smoothly and 4th session will be admitted this year. This degree program targets almost all areas of applied microbiology namely Veterinary Microbiology, Medical Microbiology, Pharmaceutical Microbiology, Environmental Microbiology, Industrial Microbiology, Biotechnology, Biosafety and Biosecurity, Quality control in Food industry, Dairy Industry, Beverage Industry, Mineral Water Industry, Leather Industry, Cosmetic Industry and Dying Industry. Primary objectives of B.S. (Hons. 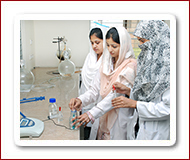 ), “Applied Microbiology” Degree are to train and educate the manpower in the field of applied microbiology, to promote collaboration between national and international universities and institutes in the field of microbiology, to produce qualified and skilled man power at certificate, diploma, under graduate and graduate level in the field of microbiology and to explore new avenues in the field of microbiology, especially in the areas of food microbiology, dairy microbiology, food safety, food hygiene and quality control. This unique unmatched program covering a gambit aspects of microbial life and their beneficial role is not offered anywhere in the country.